Nice to meet you all ! My name is Nick and I have spent most of my life living, studying and working in the United States before settling back in Moscow in 2013. I was fortunate to have the opportunity to be bilingual and will be glad to share my experiences and perspective with you all. I am currently working in HR consulting but intend to pursue teaching in the immediate future. I look forward to getting to know everyone at ECC and participating in many interesting discussions. Hi my name is Evgenia, I have lived in New Zealand since I was little. I fell in love in Moscow and decided to stay! 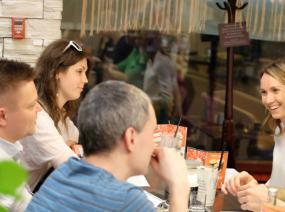 I have had experience in teaching English in Indonesia as well as leading small discussion groups in Moscow. I hope to meet you soon! Hi, my name is Jose. I was born in New York, raised in Maiami and spent a few years in Los Angeles. I've been teaching English in Moscow for a year now. I'm looking forward to seeing you in our exciting and fun meetings. Don't forget to bring your sense of humor! I am an alumnus from two British universities with 10 years' experience of living and working in the UK. Now I work as an international law expert and interpreter for high-ranking Russian officials and high-level international visitors. Come along to tear down your language barrier and enjoy our intellectually rich and friendly discussions! Hi, my name is Raj, I am from Bangalore city in India. I am a kind, patient, understanding, intellectual person. About my hobbies - i like traveling, horse riding, river rafting, rock climbing, playing football and chess. I have been speaking English since my school days as I studied in Canadian International school and communicated with friends and family members in English. As a teacher of English I’ve come to realize many of Life's Failures are people who did not realize how close they were to success when they gave up and stopped believing in themselves. It gives me great pleasure teaching people and making them realize how intelligent they are and can become. Learning to speak English well may be the best thing you can do to improve your life. English makes you a more powerful, happier person. English Communication Club was established in Moscow to satisfy it`s members need to speak English regularly, and we pride ourselves on providing our members and guests with such an opportunity. I am pleased very much to invite you in the English Communication Club. Let me assure you that my colleagues and I will do our utmost to make your leisure both fruitful and enjoyable. Do you want to get leadership experience? Do you want to practice your spoken English? Do you want to find new friends? Here is YOUR chance – a position of Discussion Leader at English Communication Club. Meetings are run twice a week (Wednesday, Sunday) and you can choose a schedule that suits you (leading once in 2 weeks, once a week, twice a week). Are you interested? Then send a letter with note "I'd like to become a Discussion Leader" to Alexandra at news@englishclub.org.ru or call (8 905 524 45 58). In case you have any questions, don't hesitate to ask! We are looking forward to seeing you as part of ECC Team. Hi everybody! Welcome to the English Communication Club! ECC is a place where you can feel at home, have a drink, relax and speak English! We'll take care of everything else: places, drinks, topics, vocabulary lists, friendly atmosphere and even parties every now and then. Come and have fun! Have fun and speak English! We’re looking for an ADMINISTRATOR. You will have to help to organize club meetings and to register guests. In exchange you can participate in Club meetings for free. You can choose a schedule that suits you (one, two or three times a week). 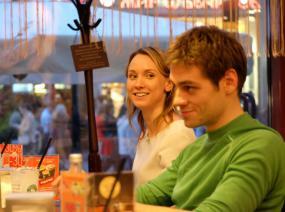 I'm a native English speaker from the USA, and I currently teach English in Moscow. I enjoy the work because I like to have interesting conversations with my students, and I like to experience new cultures. I'm glad to be able to help people learn English, and to be like a cultural ambassador. That's part of the reason I started working at the English Club. Hello, my name is Brandon. I am a 22 year old American English teacher, independent, hardworking, with constant curiosity to travel to new countries and analyze different cultures. Hope to see you all in the upcoming sessions, could be fun and a friendly atmosphere! Don't let the name fool you :) I was raised, educated and have worked in the UK and the USA all my life (hence I can help fine tune that British accent or Brooklyn twang of yours). I am also not a crocodile, for those of you that were wondering. Based in Moscow for the time being. I have been fortunate to have traveled for work and leisure to over 40 countries. I work in commodities markets. I look forward to discussing multiple topics with all of you, be it the economy, politics, traveling etc. Don't let the name fool you :) I was raised, educated and have worked in the UK and the USA all my life (hence I can help fine tune that British accent or Brooklyn twang of yours). I am also not a crocodile, for those of you that were wondering. Based in Moscow for the time being. I have been fortunate to have traveled for work and leisure to over 40 countries. I work in commodities markets. I look forward to discussing multiple topics with all of you, be it the economy, politics, traveling etc. Hi there! My name is Luca, and I'm a native English speaker from London, England. As an English language teacher, I recognise the importance of conversation practise when it comes to learning a language. 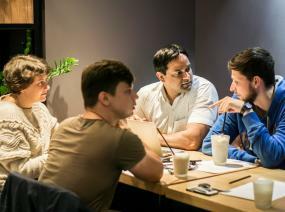 Fluency comes from practise, and that's why conversation clubs are a brilliant way to practice your speaking skills. The key to a good conversation club is an thought provoking topic and interesting people - I will supply the first and I'm hoping that you will make the second! I look forward to meeting you. 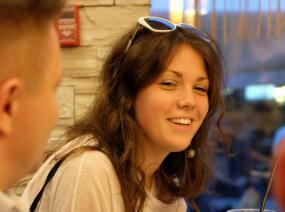 I'm English, Orthodox Christian who attends St Philip's church in Prospekt Mira, 20 years old, lively and charismatic! Also, I am easy-going, thoughtful and responsible. I've lived in Moscow since April 2013 and have taught myself Russian without any lessons, however I won't speak any Russian with you during Club meetings and even don't ask me to do so! I love working with children, art, singing, learning Russian, travelling and making new friends! I grew up in the United States of America, but have been living abroad ever since I was five years old. I've visited many European countries, made friends with people from all around the world and have experienced a wide range of cultures. My life has always been over-flooded with diversity. Yet, one thing that has always stayed the same is my passion and love for the English language - my mother tongue. Hi Friends. I am a freelance English teacher. Originally I'm from western Australia, but I've travelled all around the world. I believe group interactions are the best way to increase your fluency and understanding, tackle language barriers, improve pronunciation, and acquire the confidence to speak freely! Join me at the English Communication Club for a group chat on a wide range of interesting and talk-provocative topics. As a student of Moscow State Linguistic University i am really keen on Traveling, because knowing English gives me a wonderful possibility to go wherever i like and to feel free in communication with people from all over the world. This is possible for everyone, everything you need is to start speaking and getting new experience. A bit about myself: I grew up in Northern New Jersey. I am an international school teacher. I have taught in the United States, Spain, Singapore, China and now Russia. I have been living in Moscow for about a year and a half. My hobbies include traveling, running, reading and swimming. And... I enjoy being a discussion leader for the Moscow English Communication Club as it has been great being able to meet so many wonderful people.